The LightSpeed series are durable, lightweight trolleys that are made to last. They are rugged enough to withstand impact braking without unnecessary bulk. Our forward design puts a rider’s weight toward the front and keeps the trolley on the line, creating the smoothest ride. The forward design prevents the over-turning moment found in most trolleys, meaning longer lasting equipment and less wear on your line. 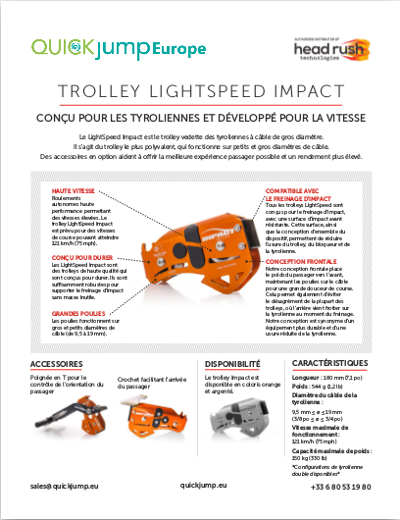 All LightSpeed trolleys are designed for impact braking with a durable front impact surface. Unlike most trol- leys, both sheaves remain on the line during braking, reducing wear on your equipment and line. A full line of TROLLEYS for all your needs. Don’t underestimate the baby of the family. 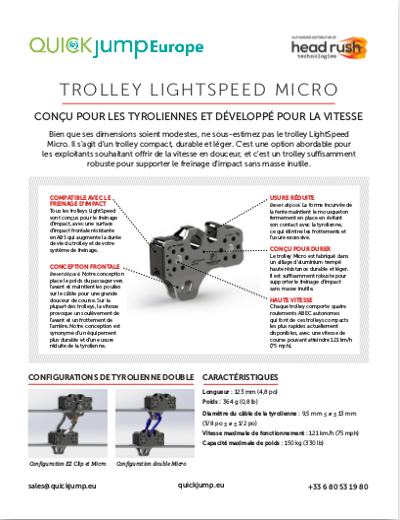 The LightSpeed Micro Trolley is compact, durable, and lightweight. It’s an affordable option for zip lines operators looking to provide a fast, smooth ride. Split-second, one-handed clipping with a true locking carabiner will make your guides happy and increase through- put. 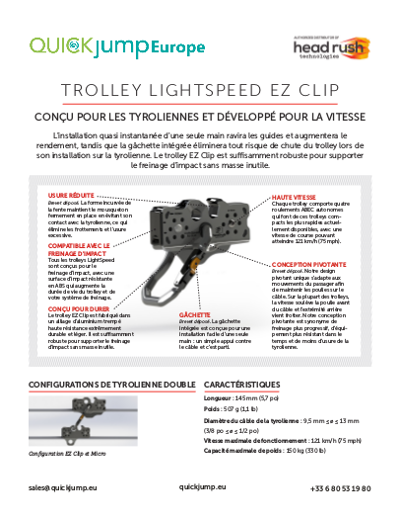 The LightSpeed EZ Clip Trolley’s integrated carabiner pivots for improved braking. The LightSpeed Impact Trolley is the premier trolley for zip lines. It’s the most versatile trolley and works with large or small diameter lines. Optional acces- sories help create the best rider experi- ence and higher throughput. 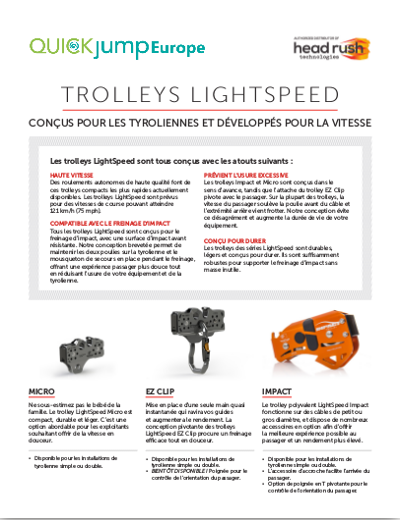 The LightSpeed trolleys are all designed for impact braking and to work seamlessly in the zipSTOP braking ecosystem. A zipSTOP braking system engages with no input from the rider or from a zip line guide, meaning it provides automatic braking that manages risk and improves the rider experience. Riders can fully enjoy the ride, and your guides can provide a better guest experience. Each trolley has a durable front impact surface that increases the life of the trolley and your brake trolley. The forward de- sign keeps booth sheaves on the line during braking, instead of wracking up like other trolleys. The EZ Clip carabiner and the Impact T-handle accessory are both designed to pivot with the rider, further improving the braking experience and reducing wear.